The remaining members of Mynock Squadron sit at an old spacer bar on Sullust called "The Tramp Freighter". 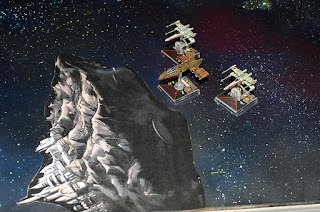 Tomorrow is their last mission together, their squadron is being disbanded and the members discharged from the New Republic starfighter corps due to cutbacks being made after the New Republic signed the Galactic Concordance. This should be a time for celebration but they are not celebrating. Three days ago their commander Kole Wuxxor and another Mynock pilot the Rodian Crada Vork were lost while scouting the borders of Hutt Space near a planet called Ord Lonesome. 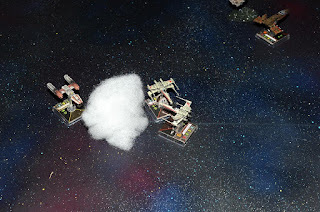 They received a distress message from their squadron mates that they were trying to land their damaged X-wings on the planet. "Damn it we can't leave this up to the New Republic. I don't believe in their rescue mission" Tash Raden says then takes another sip of her Corellian brandy. "Yeah I think we should go get them ourselves!" Dack Cuthus says crossing his arms. Jen Kule sets her ale down "You know Ackbar is urging caution. He's afraid of being too aggressive so close to Hutt space" she takes another drink "You're right it's up to us to rescue the Captain and Crada". "Well First Lieutenant I say we drop off those supplies at Void Station then make a jump to Ord Lonesome before the fleet can figure out what's going on. By the time they send someone after us we'll be on the planet" Dack takes another drink and looks back and forth at his companions. They all nod to each other. "It's settled then." Tash finishes the rest of her brandy in one gulp setting the empty glass down hard on the bar. Mynock squadron arrives at Void Station. 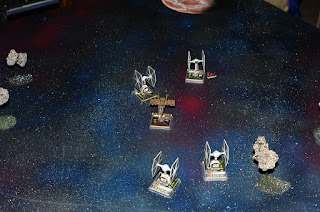 Dack and Jen pilot their X-wings while Tash flies her HWK-290 "Blood Talon" full of supplies and parts for the station. Lowbacca, Tash's copilot and gunner, man's the Talon's turret. 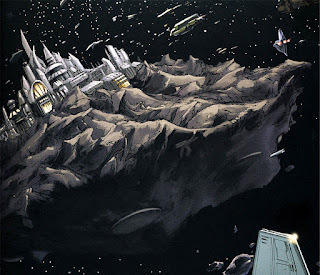 Void Station was once a pleasure palace owned by a Bothan information broker who was killed after trying to double cross Darth Vader. The Bothan government is bringing it back online to help them keep an eye on the Hutts who have been making aggressive moves into their territory. A Bothan voice comes over the comm "Mynock squadron this is Void Station. Be careful on your approach. We've had Hutt Raiders in system". 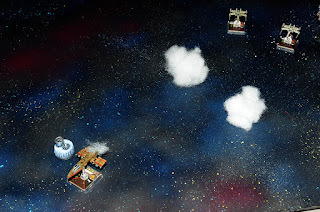 "Roger that Void Station" replies Jen Kule. Almost on cue three fighters emerge from a cluster of small asteroids. "Incoming! Two Y-wings and one Kihraxz." Tash exclaims. "Buckle up Hemmy!" Dack shouts to his Astromech. 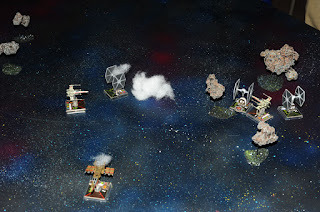 One of the Hutt Y-wings scores a hit on Jen Kule's X-wing taking down her shields but then Jen and Tash focus fire on the raider and it explodes in a brief fireball. Dack fires on the Kihraxz scoring a hit. The other Y-wing hits Jen again doing significant damage. "Get those supplies to the station Tash!" Jen commands. The HWK-290 breaks off and makes a run for the Bothan station. Dack finishes off the Kihraxz. 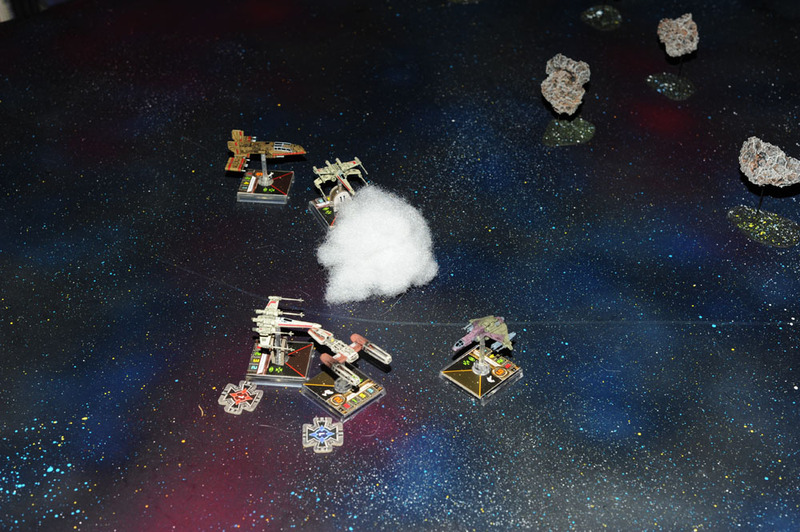 The remaining Y-wing takes a shot at Dack damaging his shielding but then moves off at full speed away from the furball. Jen throttles her X-wing after the thug firing as he flees. "Let him go Mynock 10. He ain't comin back" Dack says. "Thank you Mynocks! Those thugs have been giving us problems for days." the Bothan at the station says. 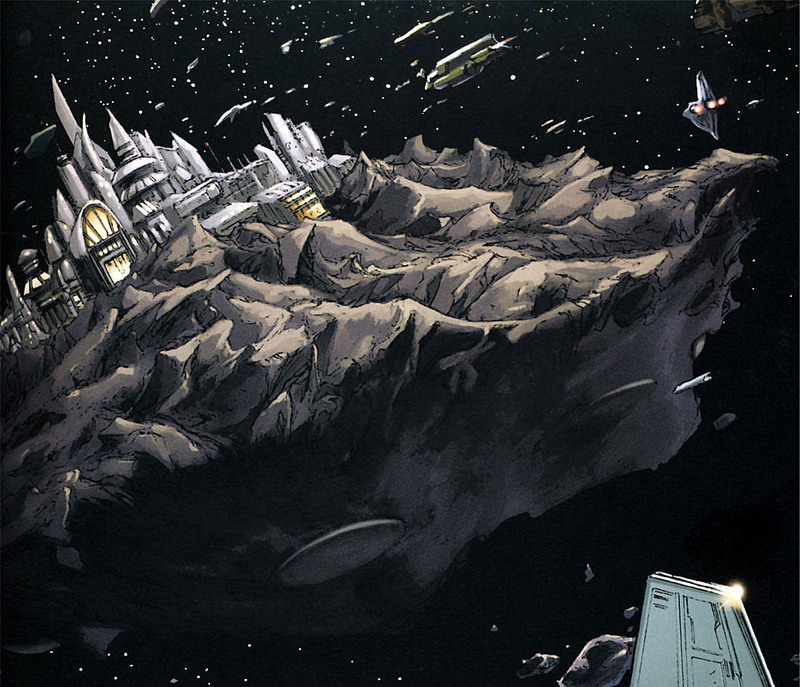 Mynock squadron lands at the station delivering the supplies. The Bothan techs patch up Jen Kule's X-wing in a few hours and the squadron takes off again. They arrive at the Ord Lonesome system after several hours in hyperspace. "Hey Jen something is jamming our communications" Tash says. "I'm also picking up a settlement on the surface. It's shielded and I'm also detecting some kind of tracking system. Probably a weapons system." she continues. "We better be careful. There is a canyon about 20 kilometers south of that settlement. Let's land there just to be safe" Jen Kule says. "Eye, eye Mynock 10" Dack replies. The three ships land in the Canyon and the pilots gather their survival supplies before heading out. "Lowbacca will stay with the Talon. You guys should leave your R2s with your X-wings in case we need a quick extraction. I'm gonna take Pinky." 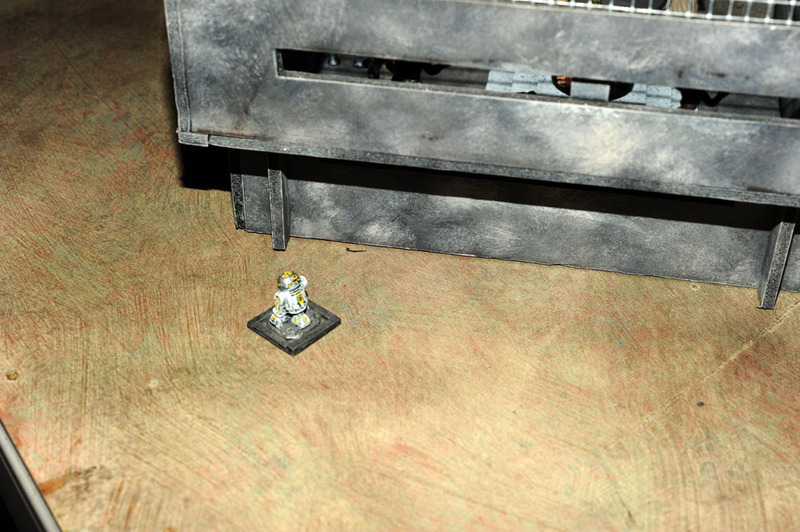 Tash pats her yellow and white astromech. "Sounds like a plan. Lowie you good with that?" ask Jen. "ARRRGHUU!" the Wookie gunner replies in agreement. The trek across the desert is difficult but their pilot survival training serves them well. There is not a lot of life on Ord Lonesome. Some lichen and scrub dot the landscape and a few small lizards dash about between the rocks. They stop to take a drink from their canteens when suddenly R2-P3 beeps a warning. "What's up Pinky?" ask Tash. "Look out!" shouts Dack. A large, furry, hound like creature charges the party. The pilots fire their blasters at the creature as it closes in on them but it dodges their shots. The beast leaps at Dack snapping at his throat. Dack steps aside and dispatches the hound with a single shot behind it's ear. "Well I guess there is something on this planet more than a bunch of lizards" Dack says breathing heavy from the excitement. After several hours travel by foot the three pilots approach the settlement. A sign outside the town reads "Fort Lonesome". "Not too creative with their names here." says Jen. After entering the town they see an old man working on some kind of beat up speeder. "Hey can you point us to the local watering hole buddy?" Tash ask. "Why sure folks" says the old man "just head down this street towards the fort. the 'Lonely Spacer' is just across from the fort. Can't miss it. More tables on the outside than inside. Should be pretty busy this time a day." "Everything lonely or lonesome around here eh?" Jen ask. "Well it's kinda fittin ain't it?" the old man shrugs "You folks have a nice day and watch out for Zorrax's enforcers". The old man waves as they walk away. "Who do you suppose this Zorrax is?" ask Tash. "No idea" says Dack. About half way to the cantina a group of thugs wearing some kind of Hutt clan symbol approach the three pilots. "You there. Your new around here. The mighty Lord Zorrax the Hutt demands tribute from all off worlders. That will be fifty credits if you don't want any trouble." a Rodian thug says. "That so?" replies Tash "You don't look like a tax collector." her hand settles on her blaster pistol grip. "Let's just pay them. We don't want any trouble." says Jen. "Oh fine, you guys owe me." says Tash as she tosses the Rodian a cred stick. "I was kinda in the mood for trouble" Dack whispers under his breath. "That's better. You may now enjoy the comforts of Fort Lonesome." 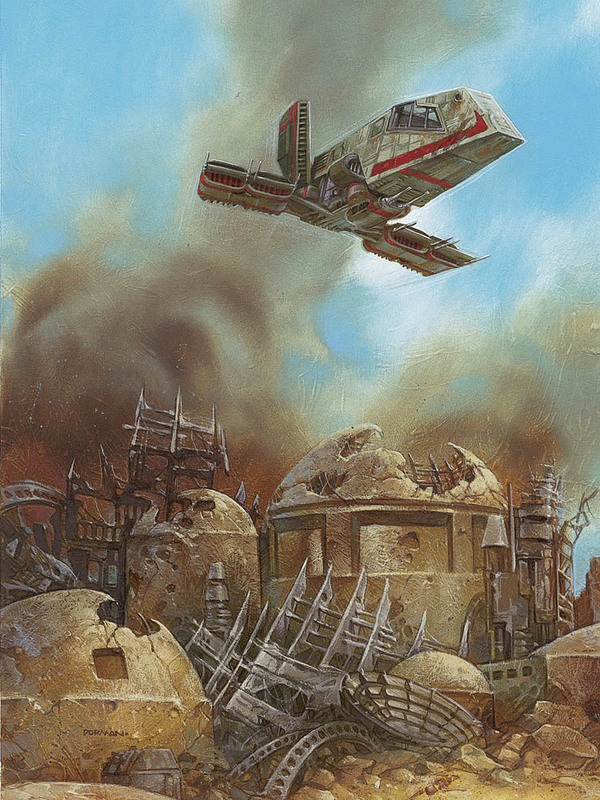 the Rodian thug spreads his arms indicating the surrounding town of broken down adobe structures. The thugs laugh to each other as they walk away. "Lovely folks in these parts." Dack says. "That's the way it is out here in the Outer Rim." replies Tash. They press on to the cantina. It's a small adobe building not much larger than the surrounding houses. Several tables sit outside the structure just as the old man described. "Oo oo Ootini!" a pack of Jawa surround R2-P3. "Hey back off that's my droid!" Tash shouts pulling her blaster from her holster "A little far from Tatooine?" she say pointing her blaster at one of the scavengers. Putting his arms in the air the Jawa excitedly says something unintelligible to his companions and they all scurry away around the corner. As they enter the cantina an old human woman leaning against the bar says "Welcome to the Lonely Spacer what can we get you?" she takes a drag off her cigarette. An old and odd looking droid serves their drinks and the three begin to mingle with the crowd trying to gather information about their missing companions. After a while Tash motions to the others to go outside. The three find an empty table and sit down. Tash leans in speaking low "That Duro in there gave me some good intel." she looks around before continuing. "This Zorrax the Hutt has only recently taken over the town. He's got his headquarters at the fort." again Tash scans the areas before speaking. "According to the Duro, Zorrax has our friends but he also told me he's got some kind of renegade Imperial allies calling themselves 'The Dark Shadows'". "We should try and talk to the Hutt." says Jen "Perhaps we can pay a ransom or do some kind of job for him and get our comrades back". "Let's go look for that Rodian. Maybe he can get us in to see his boss" replies Dack. They come across the Hutt enforcers in the midst of a conversation about pod racing. The thugs are so wrapped up in their discussion they don't notice the humans approach. "Zorrax told me himself that he's going to set up a new stadium here on Ord Lonesome. Now that the Imperials are gone lots of people are talking about starting the circuit up again." the Rodian says to his friends. They nod in agreement. "Hey there we need to talk to your boss." says Tash. The Rodian spins around "You three again?" he says coldly. "If you want to talk to Lord Zorrax it's gonna cost you.... 200 credits each for an introduction." the Rodian continues. "That's a bit steep!" Dack growl drawing his blaster. "Now, now friend it's a small price to pay for an audience with a Hutt!" the Rodian says putting his hands up and backing off a few steps. "How bout we just shoot you then and take your jobs?" says Tash. "Wait, no!" Jen yells looking back and forth between her companions in shock. The thugs reach for their blasters as Dack drops the Rodian leader with a shot to his chest. Blaster fire fills the small street. Tash ducks behind the corner of a building for cover. Jen snaps out of her shock and joins in the fire fight. Thugs drop one by one but Dack takes a shot to the shoulder. 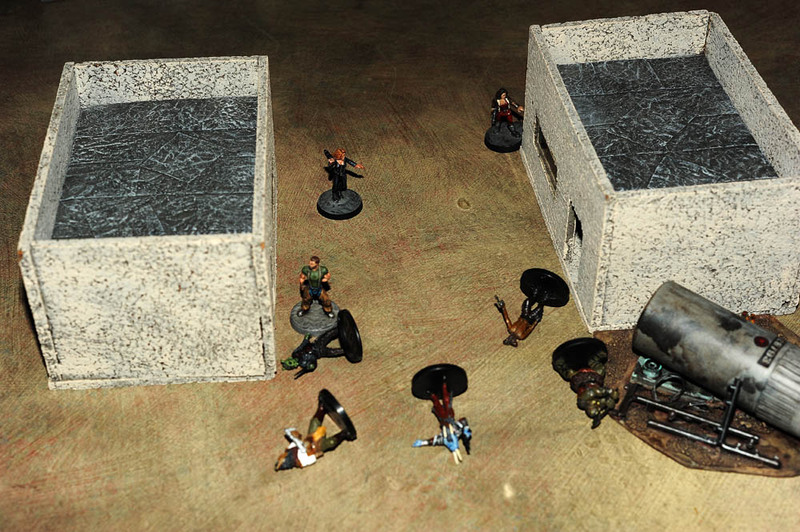 In a few moments all five thugs lie on their ground. "Poodo, one of the bastards got me." Dack says digging the med kit out of his survival pack. Pulling on one of the thug's jackets Tash points to the clan patch "Let's go see this Hutt about getting a new job." Jen shakes her head but grabs a jacket and follows the others towards the fort. Walking up to the fort there are a few thugs milling about but no one seem to pay them much attention. 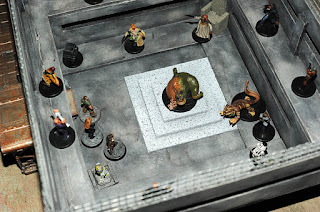 Stepping into the largest structure they see a Hutt napping on a small dais surrounded by thugs. Behind him is a Nexu with a Klatooinian handler. Sitting to the Hutt's right is a Quarren. The Quarren stands and says "Mighty Zorrax we have unannounced guests." The Hutt shakes his head and opens his eyes looking straight at the three pilots. At first Zorrax looks surprised but then he scowls "Who the hell are you and why are you wearing my colors?". Tash steps forward spreading her hands with her palms out but the Hutt cuts her off with a wave. "I have few humans in my service and you are not them. How dare you wear the crest of the Desilijic clan in my presence! Explain yourselves!" Zorrax booms now clearly enraged. Tash stammers "M, ,mmm, mighty Zorrax we intended no insult. Clearly you have many unworthy enforcers in your organizations. You need more talented people protecting you. Allow myself and my companions to serve you we are..". "Silence fools! You think you can murder my loyal subjects and get away with it!" the Hutt yells. The Klatooine moved up next to the Hutt, loosening the leash on the Nexu. The creature pulls forward towards the three pilots. The rest of the thugs raise their weapons. Raising his arm the Hutt seems to regain his composure. "I will not abide such insults" he says "Kill them!" the Hutt points at the three pilots. The interior of the fort erupts in blaster fire. 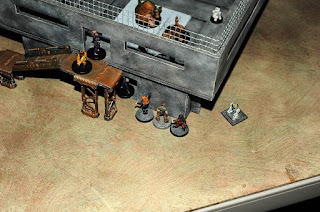 The Nexu's handler lets go of the creature's leash and it leaps forward towards the New Republic pilots. Drawing their blasters the three run shooting as they flee. Jen drops the Nexu with a single shot between the monster's eyes. "ARRRRGH! Kill them! Kill them all!" Zorrax howls in rage. Ducking out the back unnoticed R2-P3 moves away as fast as his propulsion motors will allow him. 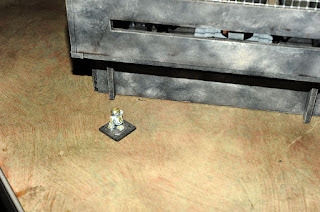 The droids audio receptors pick up the commotion inside the fort. Scanning the surrounds for a safe place to hide he emits a low whistle through his binary vocabulator trying to calculate the reasoning behind his organic companions errors. Tash, Dack, and Jen make it out of the building. Jen drops the Klatooinian in the door way. Tash shaps off a shot and knocks a Aqualish from a walkway above them. "Quick get to that small bunker, we can take over that launcher!" Tash shouts. The three Mynocks run towards the small bunker with the Hutt thugs in close pursuit. Falling behind them Pinky chirps at them in binary. Suddenly two blaster bolts strike the droid stopping it in it's tracks. Smoke pores from the droids housing and the doid shuts down with a low whine. "Pinky!" Tash shouts but she keeps running. 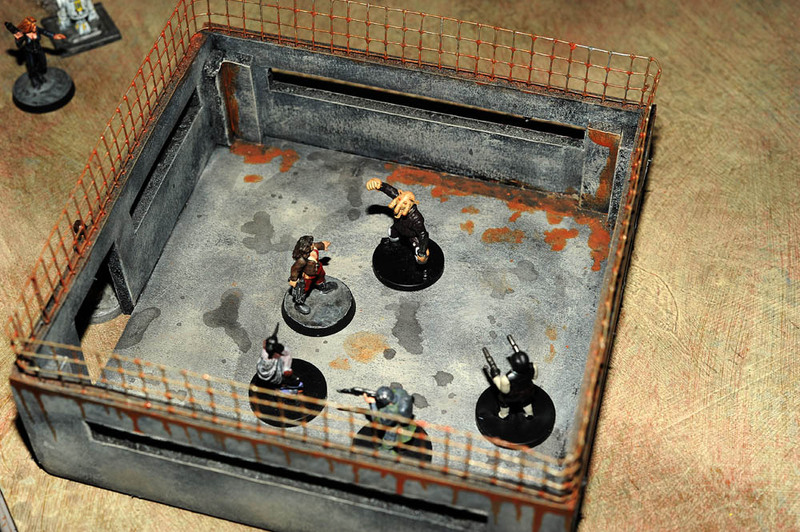 Tash is the first to reach the bunker. She runs inside firing behind her as she flees not realizing that there are four other Hutt enforcers inside. "Poodo!" she shouts raising her blaster she tries to shoot at a Gran in front of her. With a pop her power pack shorts out. Tossing the useless weapon aside she steps forward and punches the thug in it's middle eye-stalk. 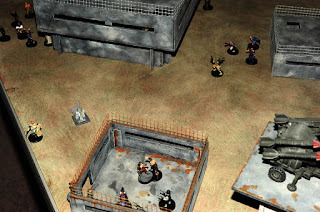 A frantic battle ensues inside the the small bunker. 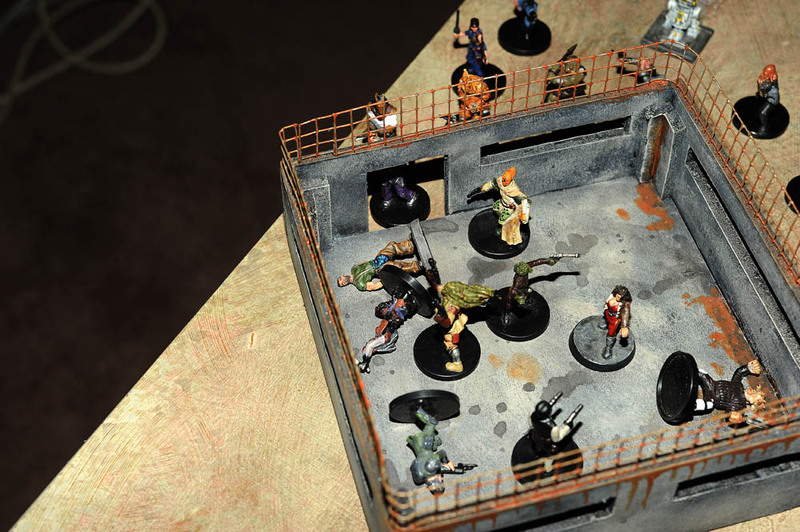 Jen shoots a thug then scrambles up the small ladder to the roof of the structure. Even in close quarters both the thugs and pilots miss several shots trying as much to avoid getting killed as anything. Dack drops a thug as Tash knocks the Gran out with another punch but then Dack takes a shot to the guts and goes down hard. Thugs converge on the small bunker from all over the fort. Through a hail of blaster fire Jen scrambles across the roof of the bunker and hops into the crew served concussion missle launcher. Jamming the launchers joystick to the left Jen targets the other launcher and fires. In a massive explosion the other launcher goes up in flames. She then targets the main structure of fort and fires again. 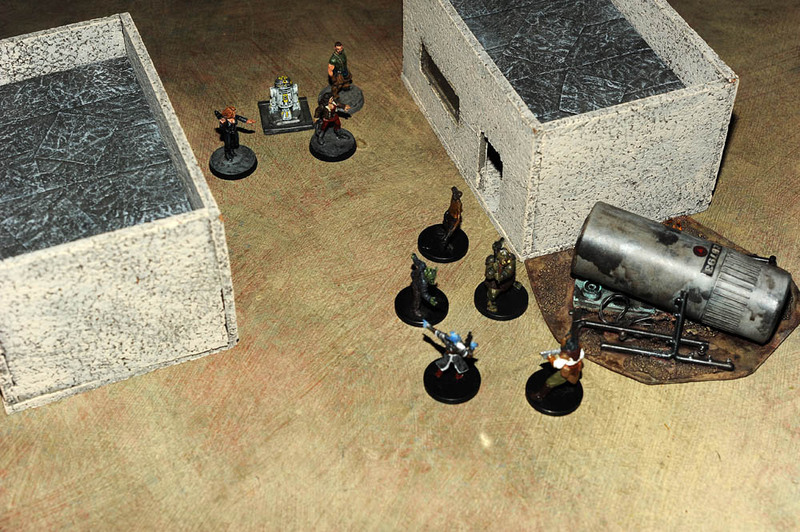 Chunks of ferrocrete fly in all directions sending the the thugs outside scattering. A few thugs are hit by the flying debris and killed or knocked out. 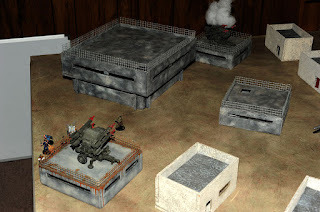 From inside the smoking fort everyone can hear Zorrax yell "Stand down! Stand down! Bring their leader to me!". Tash looks around. Surrounded she put her hands up and says "Try anything funny and my friend will bring that fort down on top of your boss.". 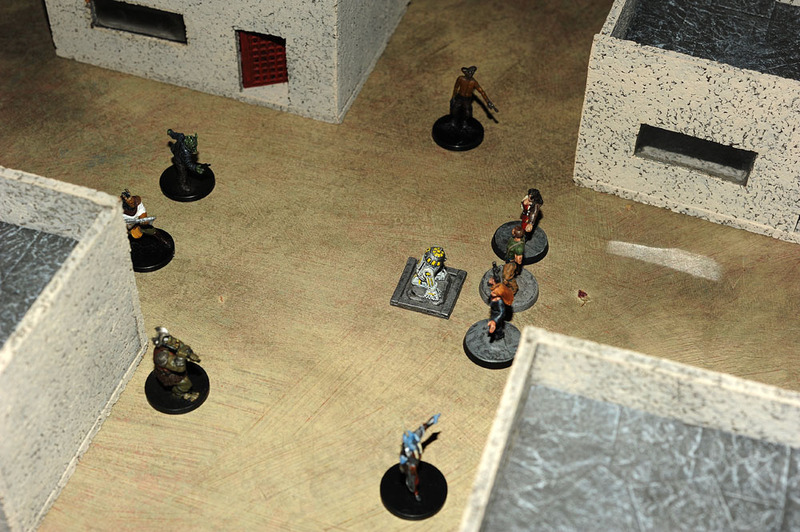 A Rodian thug grabs Tash by the arm and leads her out of the smaller bunker. Tosh looks up and sees the Blood Talon and the two X-wings flying towards the fort. She looks down at her smoking droid and realizes that it must have contacted her copilot before it was destroyed. She tries to pause for a moment as she looks at her loyal astromech but the Rodian thug drags her on. "Well, well, it seems you scum are more trouble than I took you for." grumbles Zorrax. "Tell me why you are really here?". "We're just out of work pilots looking for a new job. That Hawk 290 outside is my ship and the two X-wings with it belong to my companions. "X-wings and a Hawk 290..." the Hutt contemplates "You still take me for a fool. You are with the New Republic. You are here for your pilots" Zorrax crosses his arms. "Yes we are and we have you at a serious disadvantage." replies Tash. "So you do. Fetch the prisoners." commands the Hutt. 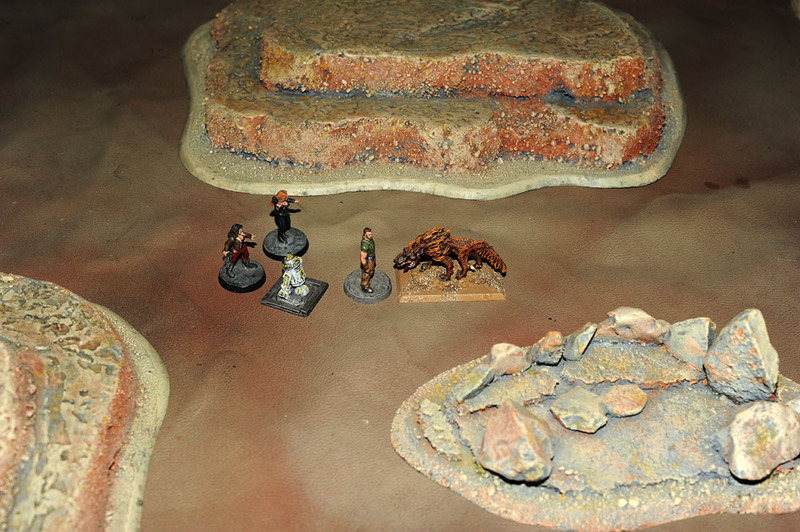 Captain Kole and Crada Vork are brought into the fort. "Release them." Zorrax. A Gammorian cuts their rope bindings. "Well this is an interesting rescue operation you have going here Lieutenant Raden." Captain Wuxxor says turning to Tash. "Yes sir, you could say that." replies Tash. "The New Republic will pay for heavily when my clan hears about this!" Zorrax says angrily. Pointing at Tash the Hutt continues, "And you and your friends will have a bounty on your head so large you won't be able to go anywhere in the Outer Rim without being killed.". Without another word Tash turns and leaves with the other two Mynock pilots following. Outside she sees that Lowbacca is already towing Pinky up into the Talon with a magnetic grapple. The Wookie lowers a chain ladder and a harness that they use to recover the others. Before exiting the launcher Jen fires her blaster into the controls. She's the last one aboard the Talon. As they head back towards their rendezvous point Jen says "That's the last time I ever want to try and negotiate with a Hutt". Back at their canyon landing site Crada Vork secures Dack into a bunk on the Blood Talon and begins to tend to his wounds. "I suggest we get out of here as soon as we can. 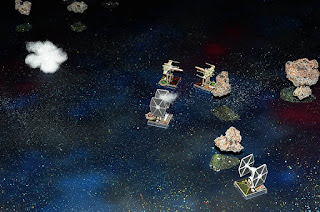 I'm taking Mynock 11's X-wing." Captain Wuxxor explains. "Yes sir!" the others reply in unison. The three ships take off. "Well have to get to the nav beacon before we can jump out of the system. Let's head to Void Station first. Dack will need their help." Kole commands. "Roger that Mynock 1" replies Jen. "Sir I'm picking up TIE fighters approaching from the nav beacon!" Tash shouts over the com. "Attention Rebel scum this is the 'Mauler' of The Dark Shadows. Surrender now or be destroyed!" comes a voice over their comms. the TIEs swarm in heading straight for the HWK-290. Jen and Kole split off heading for some cover. "Flank them!" commands the Captain. The lead TIE opens up on the transport scoring a direct hit. "Shields out!" shouts Tash "You guys better hurry or I'm space dust!". The TIEs swarm around the Talon scoring several more hits. Lowbacca fires back at one of the hostiles doing some damage to the small craft. 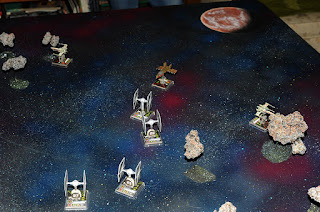 The X-wings turn back into the fight. 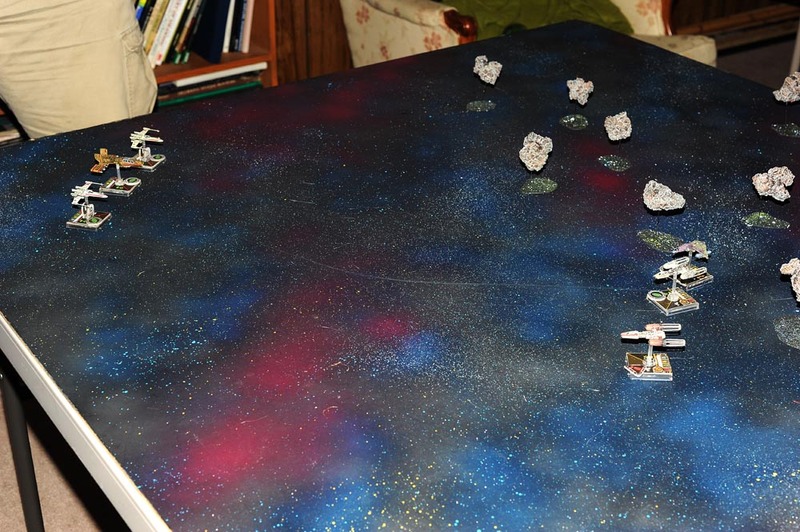 Captain Kole takes out the lead TIE in a hale of laser cannon fire. "Good shot Captain!" Jen shouts. Panicking the TIE pilots turn to engage the X-wings. Jen lines up another Imperial fighter and shoots damaging the enemy fighter. Captain Kole knocks out another TIE "Scratch two!" he shouts. As the Talon reaches the Nav Beacon the two remaining TIE's turn to pursue with the Mynock X-wing hot on their tails. 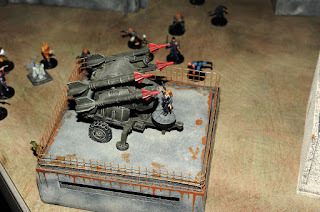 Before the former Imperials can fire the Mynocks destroy them. "That was way too close!" Tash exclaims as she engages the HWK-290's hyperdrive. Mynock Squadron drops out of hyperspace in the Void station system. Ahead of them they see a small New Republic fleet orbiting the asteroid base. Their comms crackle to life. "Mynock Squadron proceed to Void station and land. Do not attempt to flee. That would be most unfortunate.". "Don't worry I can assure you we will comply" replies Captain Wuxxor. After landing the Members of Mynock squadron are escorted to a large conference room. 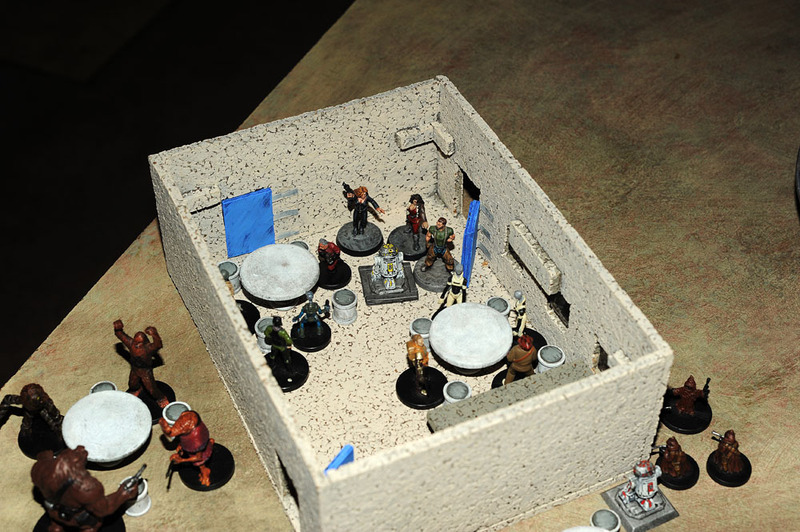 Sitting at the table is Admiral Ackbar and several New Republic officers. Ackbar stands and walks towards Captain Wuxxor shaking his hand. He then turns to Crada Vork shaking the Rodian's hand as well. "I'm so glad to see the two of you alive. Welcome home." Ackbar says. "Thank you Admiral." Wuxxor replies. 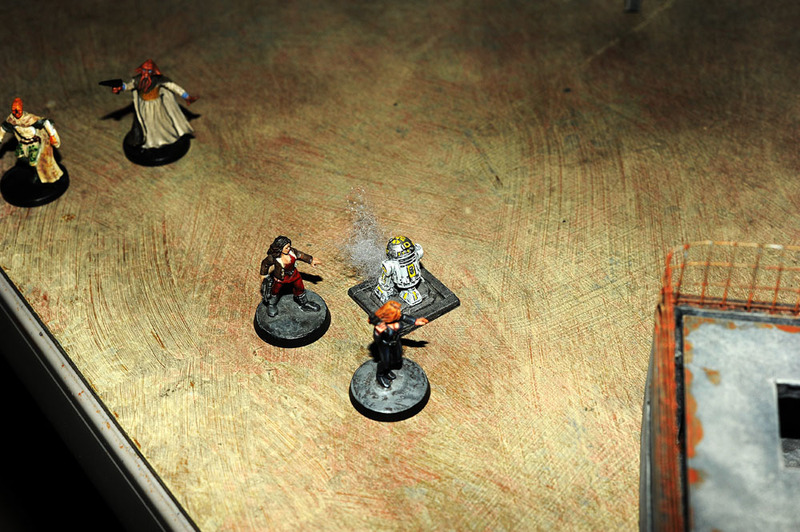 "As for the rest of you" the Admiral turns towards, Dack, Jen, and Tash. "I should have you thrown in the brig and put up on charges but seeing as you are at the end of your service with us the New Republic has decided to give you an honorable discharge. We will however be taking your last months pay to help us cover the cost of your little adventure. It will cost us a small fortune to repair our relationship with the Desilijic clan. They are still none to friendly towards us after that incident on Tatooine." he pauses "Good luck with your new life and may the force be with you.". The members of Mynock squadron snap to attention and salute "Yes sir!" they reply in unison. The Admiral returns their salute then exits the room. Later the former members of Mynock squadron sit in the stations bar quietly nursing their drinks discussing what their plans are. A female Bothan waitress approaches them. "Out of work eh?" the Bothan remarks. Jen smiles and nods at the waitress. "Hey it could have been worse right?" the Bothan continues. "Listen I've got a friend on Corellia named Rogan Dexter. 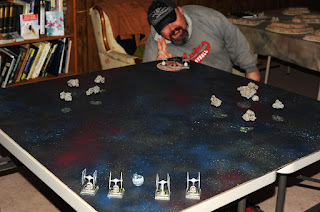 He's looking for good X-wing pilots for a private security squadron he is forming. I saw the way you handled those Hutt raiders a couple days ago. I'll put in a good word for you." the Bothan says. Crada Vork hands the waitress a cred stick. "Thanks doll, we'll look into it." the Rodian says. "Take care!" the waitress replies as she walks away. Crada turns back to his companions. "Well what do you think?" Crada ask "The merc life is better than nothing." 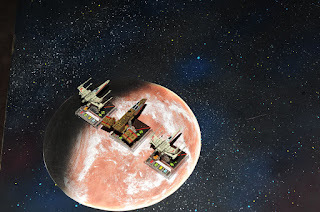 The Blood Talon departs Void Stations bearing a fresh coat of red paint with off white markings. Once clear of the station Tash reaches for the hyperdrive controls. "Next stop Corellia!" she says as she engages the drive. Notes: Well that adventure was an exercise in going off the plan. I was completely taken aback when the players decided to try and strong arm their way into Zorrax the Hutts organization. It wasn't helped by the fact that none of their characters had any kind of negotiating skills and then they completely fumbled their attempts at diplomacy. Despite all that I didn't have to fudge many of my roles even if I did have to be a little unrealistically forgiving in resolving the problems that ensued from the frantic combat at Fort Lonesome. Sometimes those kinds of completely botched up games can be the most fun to play. 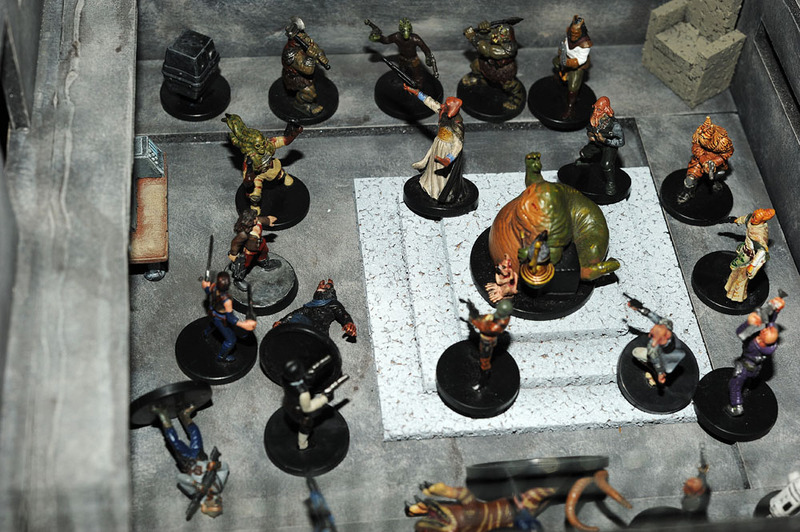 It was certainly one of the more exciting sessions I have run so far and it was a lot of fun for me getting to play the part of an angry and enraged Hutt. Everyone seemed to have a good time. Great series so far :D Thoroughly enjoying the read through. Look forward to the next installment.